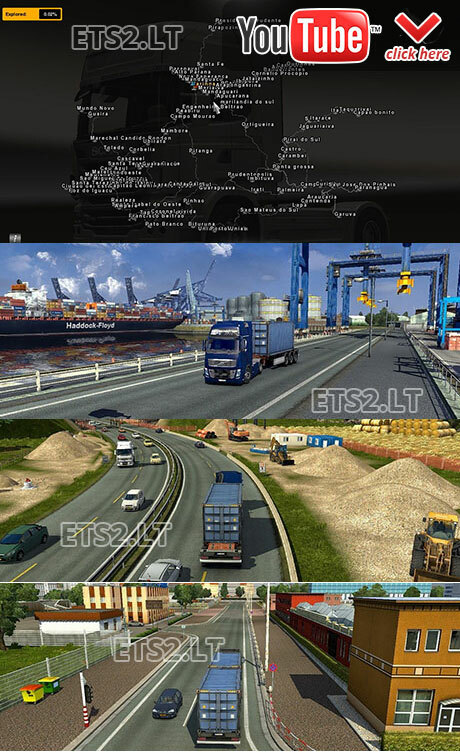 New Map for Euro Truck Simulator 2, namely the map of Brazil. It’s a fairly large map with many cities, pesaije us new roads, driving experience us. Each stage is an important area in Brazil with more cities. The map was tested on version 1.3.1 of the game and go smoothly. The author also says that there is no need for a new profile will be able to play. This map is so strung out between the European areas and the Brazil portion. It wants to send most loads back over to Europe and not in Brazil. But at least 2 out of 20 loads stay in Brazil. The big mistake about this map is WHY SPEED BUMPS AT MOST FUEL STOPS ON ALL TWO AND FOUR LANE ROADS? . No ##### puts speed bumps on FREEWAYS. There have not been any problems so far on 1st 1/3 of the Brazil portion. With this addition to the map makes delivery choices never ending. By the way for map users ,the speed bump are everywhere in Brazil!!!!. Other than that Im happy running this map. By the way someone take this guys keyboard away so no more speed bump maps are generated!! I have to admit this map is only in its infant stages. Suggestion if the plan is to improve it: (1) remove speed bumps. (2)expand the city structure in undeveloped units. There are a lot of cities that contain only a dealer and a driver hiring site, and only few buildings. The map its self has great potential for making vast driving areas. After about 12 hours of driving real time I put the map away cause there were no hauling areas active for loads to deliver. That needs to be the first improvement is MAKE THE LOADS TO HAUL, without them there is little purpose in the map. Im keeping it in my library for future upgrades, which I think are coming, are they? Dies ist nicht die Karte von Brasilien! Good and fun map, sometimes I can’t find jobs but maybe because I´m lvl 4. The game crashes after you receive the message regarding your favourite truck dealer and you go to the map to see in what city that dealer is located in! Help the map author to improve the map. Jose, congratulations on the map and its goodwill. Do they really have speed bumps on highways in Brasil? help the map outhor to improve the map. it is a nice for truckcrusing. I have a problem. I cant see Brazil on my map. Can anyone help?